THE SEA IN FRONT. Portovenere and 5 Terre. Free parking. Property 7: THE SEA IN FRONT. Portovenere and 5 Terre. Free parking. 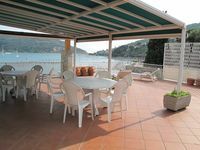 Property 8: "La Nuova Paranza" Le Grazie - Portovenere - Cinque Terre - "All Inclusive"
Right on the water !! Ideal 4 + 2 persons. Pets on request, private parking! Property 9: Right on the water !! Ideal 4 + 2 persons. Pets on request, private parking! Independent apartment with sea views, terrace, garden and pvt parking. Property 21: Independent apartment with sea views, terrace, garden and pvt parking. Beautiful apartment in Porto Venere! Property 29: Beautiful apartment in Porto Venere! Property 30: Fantastic sea view! We had a wonderful stay in this beautiful home! It overlooks the sea with a great view. Lilliana was there to greet us and answer any questions. It&rsquo;s very convenient to take a ferry to Cinque Terre as well. Many restaurants, shops and cafes all within walking distance. I would definitely recommend Lilliana&rsquo;s home!